After breaking the bait's back and snapping the beak off, pull the eyes out. This preps the bait for rigging and helps it swim more naturally. Take a 2-ounce egg sinker and feed a looped 18-inch piece of braid through the weight (waxed rigging floss also works). 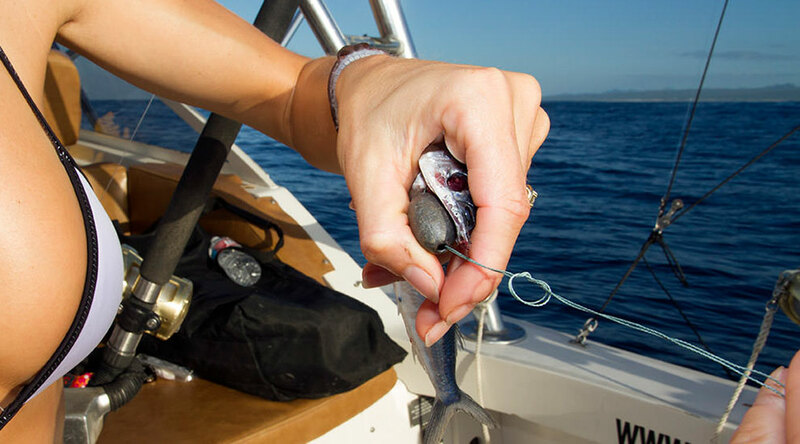 Take the loop in your rigging line and place it behind the gill plates of the ballyhoo and snug the sinker into the cavity that right below the mouth of the bait and under the gills. Keep a slight tension on your braid during the rigging process. 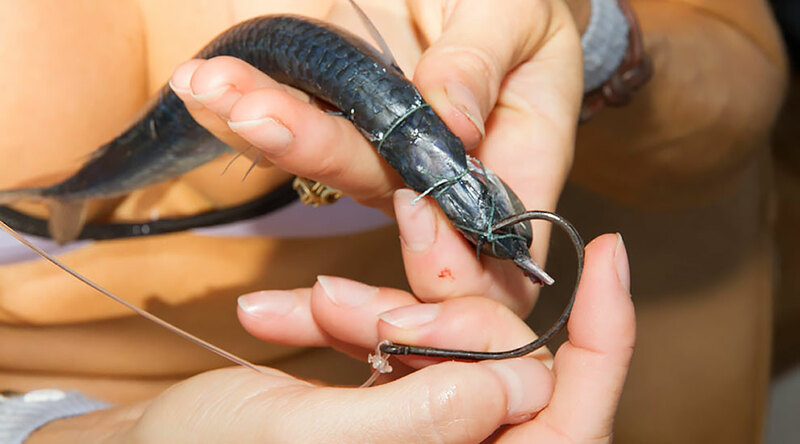 Make an overhand knot in your rigging braid about 1.5 inches from the beak of the bait. Wrap the tag end through the knot twice to create a double overhand knot. Clinch down the line by pulling on both ends until it's sung on the top of the upper jaw. Bring the remainder of the rigging line down around either side of the weight, keeping the line towards the back of the weight. Make another overhand knot in the rigging line and take two wraps in that knot. Pull both ends of the rigging line at the same time and snug the knot with the wraps down on the weight. Bring either end of your line from opposite sides in through the eye sockets of the ballyhoo. 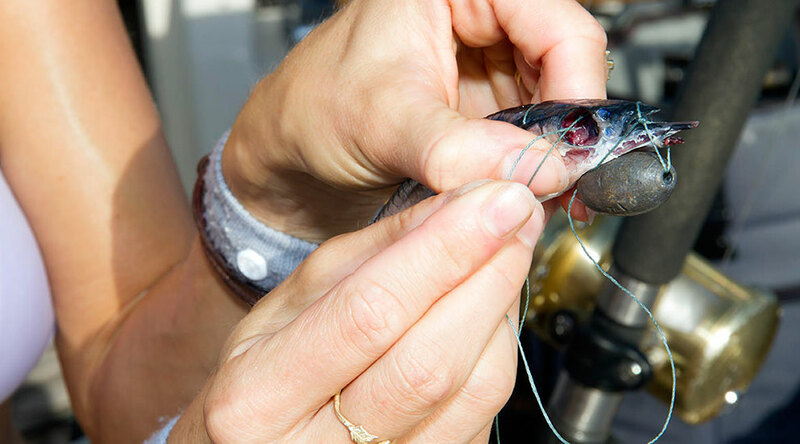 Tie the line down on the top of the bait's head over the eye sockets and trim the remainder of your rigging line. The first overhand knot you made to snug the weight into the bait will form an "X" that you can slide your circle hook through. Your weighted bait is now complete and ready for the trolling spread. Deidra caught several striped marlin and although these fish are hardy, she likes to keep them in the water as much as possible. 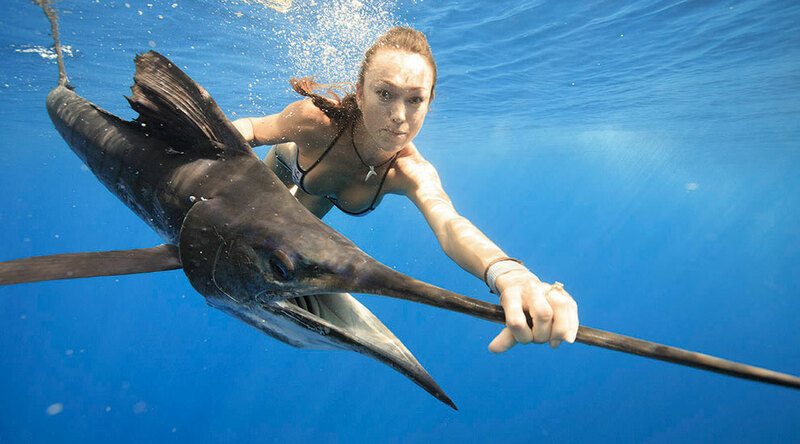 She wasn't afraid to jump in for a quick swim to revive the marlin and watch the marlin swim away healthy.